Ever since he was a child, Brad Hylan loved the idea of combining science and beauty. His ambition, passion, and natural hand skills allowed him to pursue a career in dentistry, which he considers “an incredible honor”. His impressive education background includes Ohio State University where he obtained his Bachelor’s degree followed by Case Western Reserve University where he studied for his DMD- but that wasn’t enough for Dr. Hylan. Since graduating in 1979, he’s traveled to countless lectures and has continued his education at places like The University of Pennsylvania, The Cleveland Clinic, and even Harvard School of Dental Medicine. 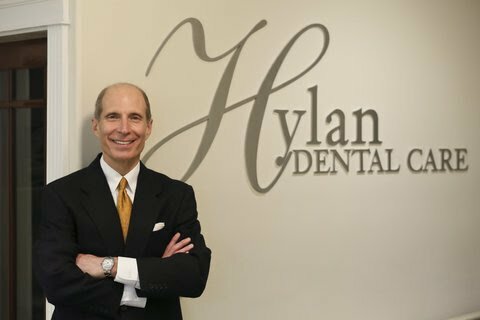 His practice, Hylan Dental Care, prides itself on trust and compassion. Their unofficial slogan, “We Cater to Cowards”, is comforting for their patients- especially for those who have had a negative experience with dentists in the past. Dr. Hylan found that most patients reporting these kinds of experiences were ones that were not adequately numbed during a previous procedure. That’s why after graduating from Case Western, he did a specialized study in anesthesia which led him to develop what he calls the “Hylan Protocol of Anesthesia”. This process involves a combination of proven anesthetics followed by specially selected anesthetic catering to the patient’s needs. Although Dr. Hylan loves taking care of his patients in the office, he stresses home care and says it’s the most important thing contributing to overall health. If there’s an infection in the mouth, it can spread to the entire body and cause further bacterial damage. To avoid this, he recommends using an electric toothbrush, a Waterpik, and floss at least once a day, preferably at night, so bacteria won’t be sitting on the teeth all night. Along with the typical dental care, Dr. Hylan recommends taking sips of water after eating to wash acid off the teeth. Hylan Dental Care wants people to know that treatment doesn’t have to be painful or break the bank. They stress the importance of maintaining dental hygiene and encourage those with pain, bleeding, or swelling to address it immediately so no further damage occurs. “Even if it seems minor you should see a dentist. Almost all big problems start out as little problems”, he explains. Hylan Dental Care has Offices in Cleveland, Aurora, Brecksville, and University Heights. To learn more, visit https://www.drbradhylan.com/.